Ayahuasca is a hallucinogenic tea made from Amazonian vines and leaves containing DMT, the chemical responsible for its powerful perception-altering effects on the brain. Ayahuasca is a hallucinogenic tea made from brewing certain vines and leaves together that are native to the Amazon. 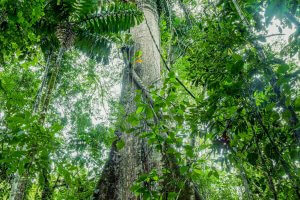 While sometimes referred to as an illicit drug, ayahuasca is a combination of the ayahuasca vine (Banisteriopsis caapi) and leaves from the chacruna shrub (Psychotria viridis). Neither plants are illegal in the U.S. However, the leaves contain the compound dimethyltryptamine (DMT), a psychotropic responsible for reports of intense hallucinations. DMT, unlike the plant that contains it, is classified as a Schedule I drug with high addiction potential and no medical use. Emerging studies, however, show there may be some benefit in using ayahuasca to treat opioid addictions and alcoholism. For centuries, ayahuasca was used as a medicine and in religious ceremonies, despite the negative and fatal reactions that have occurred. Ayahuasca is also known as Huasca, Yagé, brew, Daime, the tea, and La Purga. The plant was named by the Quechua and means “vine of the dead” or “vine of the soul.” It takes hours to brew the red-brown tea. The result has an unpleasant, bitter taste. The vine and shrub are brewed together to lengthen its effects. Without the vine’s alkaloids, drinking the leaves’ DMT would cause effects lasting approximately 20 minutes. Combined, the effects of ayahuasca tea can last between 4 and 8 hours. Because the tea’s plant material is legal in the U.S., many people believe that drinking the hallucinogenic tea is safe. However, all drug use carries risk and some people have died immediately after using the substance. 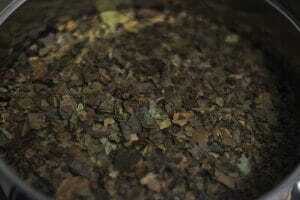 The tea is especially dangerous because its intensity is difficult to measure–most batches vary from one to another. In addition to intense nausea and vomiting, the most notable effects of the tea involve out-of-body hallucinations and altered perception that can make people see, hear, and feel things that are not real. Typically, ayahuasca’s effects begin within 30 minutes to an hour, peak between 1 and 2 hours, and last for a total of 4 to 6 hours. The immediate physical effects are largely negative–vomiting and diarrhea(or “purging”) is a routine characteristic of drinking the tea. They are so commonly experienced, in fact, that many believe that they help to “purify” the body. Vomiting and diarrhea can be potentially fatal because they are extremely dehydrating. Subsequently, cardiac arrest and seizures are a possibility. Additionally, ayahuasca’s interaction with serotonin in the brain can be lethal for people taking antidepressants. Regardless, most who try the drink report experiencing either good or bad “trips” as well as hallucinations that mimic near-death experiences. The long-term effects of ayahuasca are still being studied. Some research suggests its use is unlikely to noticeably impair a normal-functioning brain. However, common hallucinogens have been known to cause persistent psychosis and Hallucinogen Persisting Perception Disorder (HPPD)–a disorder characterized by random hallucinations or visual stimulation, such as seeing halos around moving objects. Additionally, some studies have found that psychedelic drugs, including ayahuasca, can cause changes in brain structure and personality. The risk of developing a dependence or addiction to ayahuasca are relatively low. To date, no peer-reviewed evidence demonstrates that use of the tea (or DMT) leads to a tolerance. Yet, these effects do not preclude a behavioral addiction to the experience of using the drug. Though drinking the tea has been described as “miserable,” some individuals frequently use the substance as a form of self-therapy. Because the possibility of hallucinogen-caused brain damage can be so severe, those who frequently abuse ayahuasca, take increasing amounts of it, or spend more and more time trying to secure stashes of it, should seek addiction treatment or therapy. If you are ready to make a change but need more information about detox or rehab services, talk to a recovery professional today.